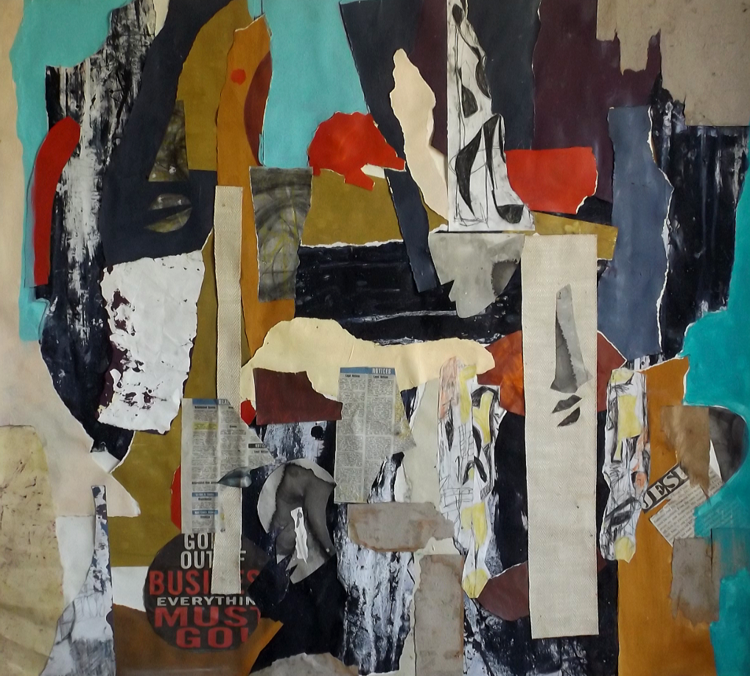 Kimberly Becoat’s paintings and collages have such spontaneous energy I was surprised to learn of the extensive research, sketching and planning that goes in to her work. Torn bits of paper overlay drawings with newspaper clippings and water-colored forms, creating dense, textured surfaces. I visited Becoat in her home studio in Crown Heights, Brooklyn in October where we talked about her work, her intense organizational skills and some of the challenges of being a black woman abstractionist. Kimberly’s work is about transcribing the beauty of her experience growing up in New York City into a visual language. The result is an intimate view of parts of the city that have resonated with her and which have come to define a particular moment in time. Her work integrates the intimacy of nostalgia and memory with the political ramifications of a city built on segregation and redlining. It is evident in her work that she is sharing with the viewer a special, historical moment of her lived experience. According to Becoat, New York is a city meant to be viewed by looking either up or down. The bird’s eye view perspective found in her work is taken directly from the experience of growing up in New York City. As a young girl, she spent much of her time looking down from her 14th floor apartment, situated between Harlem and the Upper East Side. Her family lived in the housing projects, which led to her interest in urban planning, architecture and the New York City Housing Authority. Arial views of housing, streets, gardens and playgrounds, are rampant in her work. She looks for patterns, among people and pigeons, that can be arranged and imbue order. Often a logo or familiar color pattern of a candy wrapper or cigar box can be spotted as she layers these objects directly in to the landscape of her work. Objects and items taken directly from the areas in which she lived, played and grew up, which are specific to a place and time. Her work titled, "they give us concrete gardens" is a mixed-media translation of an actual garden in the Bronx that Becoat noticed. She showed me drawings she had made on-site, as well as sketches for the collage, noting that the “garden” was downwind from the Bronx Zoo. Gold leaf, sand and tar paper assembled to form a stunning design of segmented ovals amid a pattern of stone or rock paving. Although Becoat’s work reconfigures these elements into a beautiful display of color and pattern, the original place and moments that her work points to is much more complicated. As she notes in the above mentioned work, “It was a garden for people, made out of concrete and nothing else”. Part of the lived experience that she shares in her work is about the struggle of living in a manipulated system. A system divided, based on race and class. Her work can be viewed as a comment on the how the design of cities was intended to restrict agency and opportunity for millions of Americans. In her ongoing body of work, the urbania series, titles like rooftop fantasy and deluxe apartments reference the early days of project housing that were intended for middle-income families, required a two-parent home and featured new amenities. Becoat recalls the entry of her building and the ornate patterns decorating the interior, patterns which have made appearances in the urbania series. She uses a variety of art materials including paint and watercolor as well as less conventional items like sand, tar paper, foil, candy wrappers and other detritus. As the self-proclaimed “kween of organizing” Kimberly meticulously organizes her materials by size, color and medium in to individual plastic bags. There are stacks of drawings, sketches and plans for past works and upcoming projects. The amount of research and preparation that goes in to each piece is extensive. Whether she is delving in to the histories of Sarah Baartman and Henrietta Lacks or more recently, Seneca Village, research is a key component to her work. Becoat’s studio seems to be a gestation ground where research meets intuition. We talked about narratives in visual art and the difference between an abstract narrative and a representational narrative. Can you talk about the challenges you face as an artist working with abstract narrative? This has been an issue since the 60 and 70s regarding some Black Abstract painters. Many were met with exclusion working in abstract. It is a very present problem still – mostly micro-aggressions although, not one forwardly on the table. There are times when I feel like I am justifying “why abstract?” – “Why work from that premise”? , “Why make it difficult for yourself?” as if the lineage of Black American/ Diasporian art – does not have that abstract connotation historically- from hieroglyphics, to sculptural constructs, southern quilting, or what is deemed “outsider art”- as if those spaces were never there to begin with. Abstraction is more Black than anything – the poet and writer Nikki Giovanni spoke to this recently when she said “What is space without Black people? – If the Middle Passage isn’t space, than what is?” - So the language to do such work, to do abstract work- has always been present. As for challenges?, I don’t wrestle with any of that when it’s time to create - however, I’m aware there are still subtle exclusions within and out the art community. And that’s okay. My goal always is to just do what feels right for the work – and meet the mark on the story within that work. Your work is so intimate and personal, it feels like it is in part made for the people who understand the code that youre working with, the signs and symbols of the projects and urban life. At the same time, it’s also very poetic and poignantly addresses many social issues facing New Yorkers and Americans right now. I wonder how you see the purpose of your work or even art in general? I don’t know if there’s one circular/whole answer for this – it’s a broad question, but these two quotes come to mind: one from the High Priestess of Soul, Nina Simone: “You can't help it. An artist's duty, as far as I'm concerned, is to reflect the times.” And the other from writer and activist James Baldwin: “A society must assume that it is stable, but the artist must know, and he must let us know, that there is nothing stable under heaven.” – So art or the artist should be allowed to disrupt the balance to get to the truth within the time – and time is infinite, so art and the artist should have that time to unfold/review/an upgrade thoughts on history/personal stories and even the aesthetics within all that. But that’s my outline for it! Someone else’s could and will be vastly different. Kimberly Becoat is an artist and educator living and working in Brooklyn, NY. Her work has been featured at MoCADA Museum, Essie Green Art Galleries at the Brooklyn Academy of Music, Smack Mellon and The Corridor Gallery. In 2018 she will be part of a 2-person show at Rush Arts Gallery, as well as a group show called 100 Works at Electrospective in Brooklyn. Check out her website.